Our new Hot Pink Jacket has arrived! We have lots of new arrivals in our range for Autumn and Winter 2008. 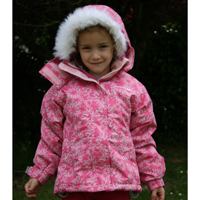 The first to arrive is a lovely winter jacket for girls from age 2 to age 10. We call it the Hot Pink Jacket (for obvious reasons) and it’s a beautifully designed jacket which is padded with a soft fleece lining that is warm and cosy without making the jacket heavy. See all the details here.